Arts Visalia is pleased to announce the upcoming exhibition of woodcut prints of the High Sierra by Bay Area artist Tom Killion in addition to an exhibition of photographs by Springville artist Michael Hansen during the month of November. Both shows will be held in conjunction with the third Kaweah Land and Arts Festival, a series of art exhibitions, nature outings, and community discussions focused on the nature of our relationship to local landscape and its role in our creative expression. 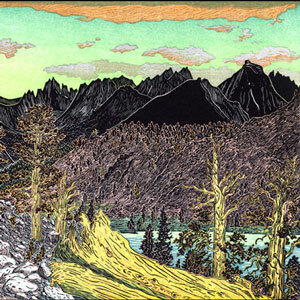 In an exhibition titled Woodblock Prints of the High Sierra we will feature artworks by Tom Killion, an artist noted for his unique style and method of printmaking. The images to be featured in the exhibition were originally made by Killion for inclusion on the large, hand-printed book titled The High Sierra of California, produced in collaboration with Pulitzer prize-winning poet Gary Snyder in 2002. The exhibition is a stunning collection of images in Killion’s Japanese-style woodcut process, with each image printed on a a German hand-cranked proofing press from multiple hand-carved wood blocks. He sells his work widely through galleries and fine art fairs and, in October 2009, Killion was featured on the PBS program Craft in America: Process. Killion lives and operates his studio in Point Reyes, California. In a similarly themed exhibition in Arts Visalia’s Gallery II, we will feature photographs of the High Sierra by Springville artist Michael Hansen. Having originally studied photography at Porterville College as well as numerous workshops, Hansen has developed a significant body of work in nature photography with many notable clients and collectors to his credit. The exhibitions will be on display at Arts Visalia from November 2nd through November 29th, with an opening reception where guests may meet the artists to be held on Friday, November 4th from 6 to 8pm. Attendance is free and open to the public. Special thanks to both the Depot Restaurant and Visual 6 Printing for their sponsorship of this exhibition. Also, complete details on all of the events associated with the Kaweah Land and Arts Festival, to be held November 4th through 7th, may be found at kaweahlandandarts.com.